Over a year ago, I wrote a post expressing my frustration in evaluating project management apps for my organization. I’ve been wanting to write a follow-up post for a while. I had hoped I could write something glowing about the tool we carefully chose. Shortly after I finished that post, we settled on Dream Factory’s Dream Team Suite. Uses Salesforce event/task and account data. 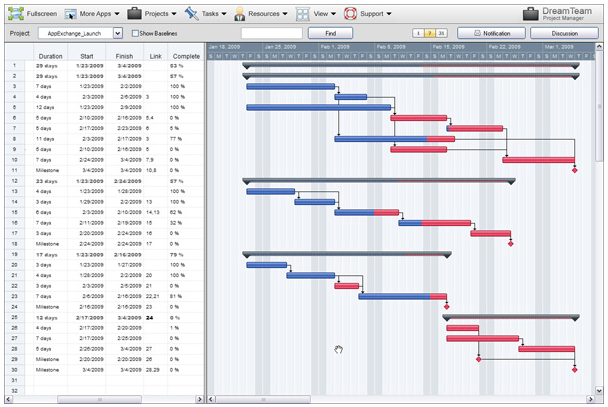 Gantt view and task dependencies. The ability share project views with non-users. 50% discount for nonprofit organizations. Mostly positive reviews on the Salesforce Appexchange. We did a number of demos and worked with the trial version for 2 weeks and thought we could roll it out successfully. Unforutnately, it was a failure and we stopped using it well before the year contract was up. #@$#@% proprietary browser plug-in which worked inconsistently across browsers. I was continually troubleshooting errors with users. Difficult when you’re supporting staff remotely, and Dream Factory staff wasn’t as helpful as I would have liked. Staff hated it. And that’s being kind. The interface wasn’t quite Mac-like, wasn’t quite Windows-like. It was something new and unfamiliar that people had to learn and it wasn’t intuitive. Staff tried to wrap their head around it, but the awkward interface quirks made everything difficult. We shared project timelines with our creative consultants who struggled with the finicky plug-in even more than staff did. Poor notifications and cumbersome reporting. Truth be told, I should have realized that the workarounds wouldn’t work. To be successful with this tool, our users would have had to live in the app which wasn’t realistic. Don’t mean to bash. I know that there are many organizations successfully using Dream Team. Large and small. I certainly heard about those happy customers every time I expressed our concerns to the company. It just wasn’t a good fit. It happens. No hard feelings. So back to the drawing board. What are we using now? Basecamp. I know. I know. After all that research. As someone who has been using/evaluating tech for many years, Basecamp drives me nuts. I can’t stand the fact that I can’t make a template from a completed project. I can’t stand how hard it is to focus when messages are flying all over the place. I can’t stand that I can’t sort task lists by due date. The list goes on. But here’s the thing…Basecamp is the easiest to get others to adopt. It offers a consistent user experience. It’s just simple enough but we’re still keeping things on track. It’s not great for complex time-sensitive projects, but we’re doing just fine so far breaking things down to basic milestones and to-do lists and taking advantage of Basecamp’s email integration. We can bring outside folks in to projects and they get it pretty quickly. We have templates for our regular events and projects and it’s working out. We’re on top of what we need to be on top of. In the end…for now…that’s enough. We’ve been looking at different project management apps too and currently are leaning towards http://www.smartsheet.com. It seems very easy to use and understand, especially if you are used to working with spreadsheets. Notifications and reports are customizable. Sharing projects with others is also easy and straight forward. It looks like a great tool for nonprofits (great price for NPs too). Check it out. If you do technology-focused consulting, and you need a Basecamp-style system that also integrates bug tracking, I created https://pmrobot.com/ and have been using it in my consulting company for nearly 3 years. Would be awesome if you could take a look and provide feedback of the pros and cons vs. Basecamp. Thanks, but no. I don’t do technology-focused consulting and don’t need bug tracking. I work for a non profit and we went to a new piece of software and it’s not intuitive and users hate it. I think that would be higher on the software makers list and the company that’s looking at new software. Something non intuitive unless the up side is huge is an indication the software company doesn’t care about the user. I know you had to choose something but the non intuitive user interface might have been a deal breaker for me. Why not have a project management tool custom built? There are any number of Rapid Application Development tools that can be used (http://en.wikipedia.org/wiki/List_of_rapid_application_development_tools#Database_Rapid_Application_Development_Tools). In your original post you wrote, “We don’t have a server so we don’t want desktop software.” However, not having your own server is not really an obstacle as there are any number of third party hosting options. Exciting news about the Convio acquisition! Wonder what’ll come next… as you’ve been getting to know a broader universe of clients, have any of them had more success in identifying a PM solution? As qwith you, we are mostly on basecamp, but IS is left out in the cold and it would be cool to find something that could get communications, IS and development on the same page.